Firefighters battling a deadly wildfire in Northern California kept it from doing more damage to the city of Redding but three smaller communities were in danger as flames closed in and residents packed up to leave. Melissa Colorado reports. 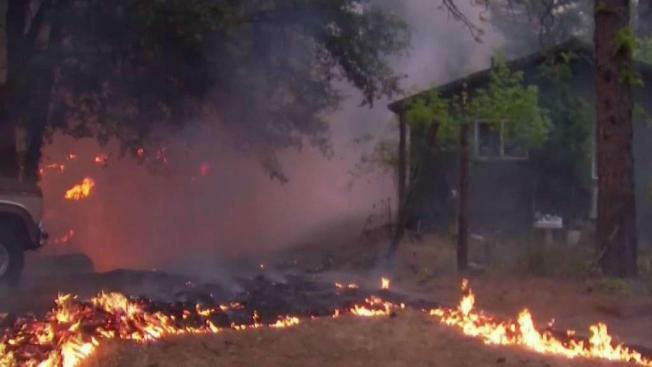 Firefighters battling a deadly wildfire in Northern California kept it from doing more damage to the city of Redding but three smaller communities were in danger as flames closed in and residents packed up to leave. The fire grew by about 35 percent overnight to 127 square miles (over 80,000 acres) and pushed southwest of Redding, toward the communities of Ono, Igo and Gas Point. The winds that aided firefighters in keeping the flames from more populated areas were propelling it forward at a frightening rate. Three Redding residents have been found dead, the family confirmed to NBC Bay Area. Five-year-old James Roberts, 4-year-old Emily Roberts and Melody Bledsoe were caught in the path of the Carr Fire when they were about to evacuate their home on Quartz Hill in Redding, Bledsone's granddaughter Shelly Hoskison said. 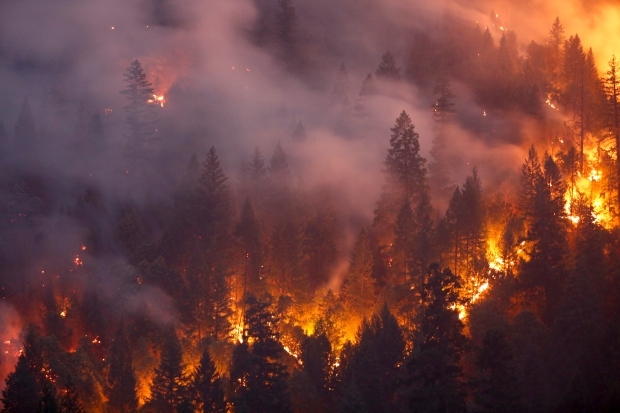 The flames moved so fast that firefighters working in oven-like temperatures and bone-dry conditions had to drop efforts to battle the blaze at one point to help people escape. Two firefighters were killed: Redding fire inspector Jeremy Stoke and a bulldozer operator Don Ray Smith of Pollock Pines. He was the second bulldozer operator to die in a California blaze in less than two weeks. The so-called Carr Fire was ignited Monday by a vehicle and exploded Thursday night, jumped the Sacramento River and pushed into Redding, about 250 miles north of San Francisco and the largest city in the region with about 92,000 residents. Two firefighters were killed and the latest tally of 500 destroyed structures was sure to rise. About 38,000 people are under evacuation orders, 5,000 homes are threatened and the fire is just 5 percent contained. Fire officials said Saturday that the number of the homes destroy "is probably much higher" that the 500 officially counted and confirmed. President Donald Trump has approved the state of emergency declaration due to the wildfires. "The President's action authorizes the Department of Homeland Security, Federal Emergency Management Agency (FEMA), to coordinate all disaster relief efforts which have the purpose of alleviating the hardship and suffering caused by the emergency on the local population," the statement read. A map provided by the California Office of Emergency Services on Friday, July 27, shows the activity of the Carr Fire. 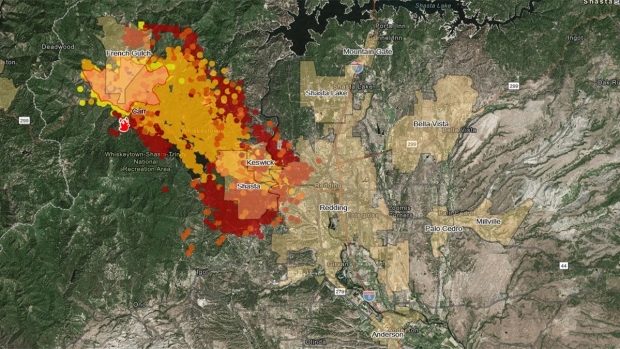 The red areas are fires that have sparked within the last six hours. 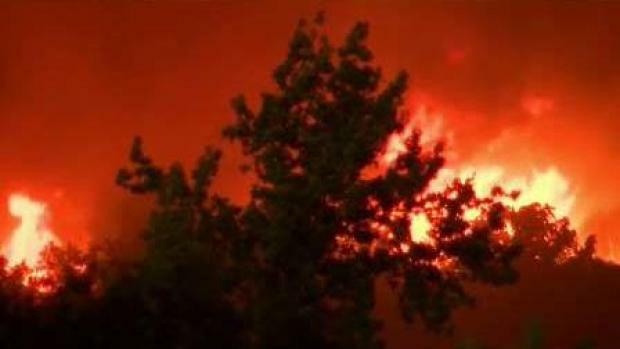 The Carr Fire burning in Shasta County in Northern California exploded overnight, breaking containment lines, according to Cal Fire spokeswoman Stacy Nolan. Sixteen structures had burned as of Thursday night, and nearly 500 were threatened by the blaze. This is video of the #CarrFire taken a little over an hour ago. Fire is 24 percent contained and still at 3,100 acres as of last update. Air crews have been grounded for the night. Ground crews will be working diligently overnight to strengthen fire lines.